Originally, I had thought I wouldn't be able to go to the food pantry today, due to a school meeting. However, since my son is in inpatient care for the past week (I'll post an update on that tomorrow, after we see him), the meeting was canceled. So Other-Husband drove me out to pick up our stuff from the pantry. It is ungodly cold out there (with wind chill, it's -5F!) and snowing, and so windy... ugh. Winter. Why did I move back to Wisconsin, again?? This being Thanksgiving basket week, they give out a specific box for Thanksgiving, in addition to the regular stuff. We also got a $10 gift card to Pick 'n' Save so we can get a turkey :) O-H's mom goes to a different food pantry, so she has a $15 gift certificate for Aldi (it specifies for ham or turkey only), so we figure she'll get a ham, we'll get a turkey, and we'll do a big dinner for everyone here. Everyone includes the 9 of us, my parents, my sister and her boyfriend, Husband's friend (friend has no family around here), and my neighbour and her son (she's having surgery 2 days before T-day). Possibly a few others if they don't have any other plans. None of us could afford to do a big dinner on our own, so we'll pool our resources, and have a damn good meal for 15-20 people! It's actually a pretty good amount of stuff this week, which is awesome. A lot of it will get set aside for Thanksgiving, obviously, and the stuff I can't use I give to my neighbour. We are going to have a "grocery exchange" at the apartment complex's office next week, too, so I'm going to bring in a bag of stuff we don't really use (cream of _ soups, mostly!) 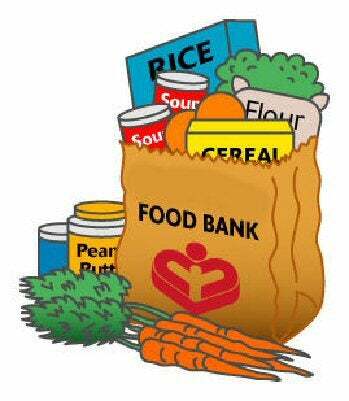 Whatever is brought in that no one takes will get donated to the food pantry.